Microsoft confirms it's investigating claims that Halo 4 has been leaked. Unless we're the victims of a rather elaborate hoax, it appears Halo 4 has been leaked some three weeks before its release date. A NeoGaf user posted a picture of what appears to be the game's two discs, and pictures of players viewing the game on their 360 dashboards have surfaced around the net. A series of YouTube videos which claim to feature footage of the leaked title have been removed from the service. 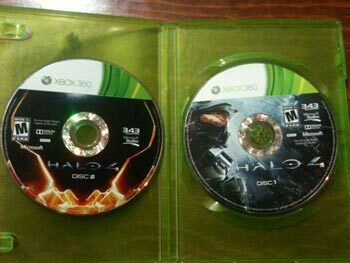 A quick rummage through the illicit archives of the Pirate Bay revealed two torrents claiming to contain Halo 4. "We have seen the reports of 'Halo 4' content being propped on the Web and are working closely with our security teams and law enforcement to address the situation," a Microsoft spokesperson told Game Informer, though he declined to confirm whether the game had indeed been leaked. Josh Holmes, creative director of Halo 4, wouldn't directly confirm the leak, but he did suggest people watch out for spoilers. "I've worked for over 3 years making Halo 4," Holmes tweeted. "Please avoid spoilers and leaks from thieves for 3 more weeks until the game is out. Thank you." "Halo 4 launches in less than 25 days. The good news is that you are that much closer to having the game in your hands. The bad news is that as discs are being made and distributed, you may start to see leaks. The internet is an awesome place... until it's no longer an awesome place. We are working closely with our security teams and law enforcement to address the situation. Piracy is illegal and we are taking vigorous action against it. We have poured our blood, sweat, and tears into Halo 4, and we want you to have the best possible experience with our game, come November 6. If you're interested in staying spoiler-free, we encourage you to exercise caution when visiting various websites, social networking services, and forums." Of course, the answer to spoilers is simply to flood the internet with fake claims to make picking out the real ones impossible. I've heard that the game features segments where Master Chief battles aliens with the power of song.